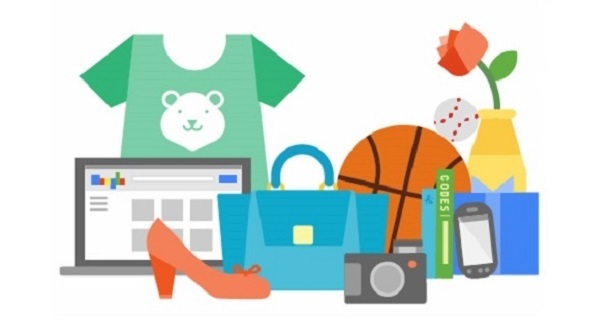 So you’ve setup Google Merchant Center and uploaded your inventory feed so you can sell products through Google Shopping. But when you log in the next day, you’re seeing all kinds of bright red warning icons saying you have product disapprovals and don’t know what to make of them. What are they? And more importantly, what are you supposed to do about them? Disapprovals not only keep an individual product from showing, but they can also trigger an account wide warning or even an account disapproval. All of this adds up to lost reach and lost revenue. So with that in mind, we’ll tackle the basics of navigating Merchant Center disapprovals. The first thing you need to be on top of is making sure that disapprovals are being seen and reported. Ideally, you want to look at Merchant Center at least as often as you are uploading a feed, which in many cases means a daily check. I don’t recommend checking less than 3 days a week, even if your feed is not on a daily upload schedule. The other aspect to this is making sure that email updates are enabled in the Settings tab on the left side of the Merchant Center interface. You want to ensure that the proper email addresses are receiving emails for critical account issues and technical issues. You can’t solve a problem if you don’t know it’s there after all. Now that you’re making sure that you’re informed of Merchant Center issues, we’ll talk about how and where to see. When you log into Merchant Center, the default screen is the dashboard. 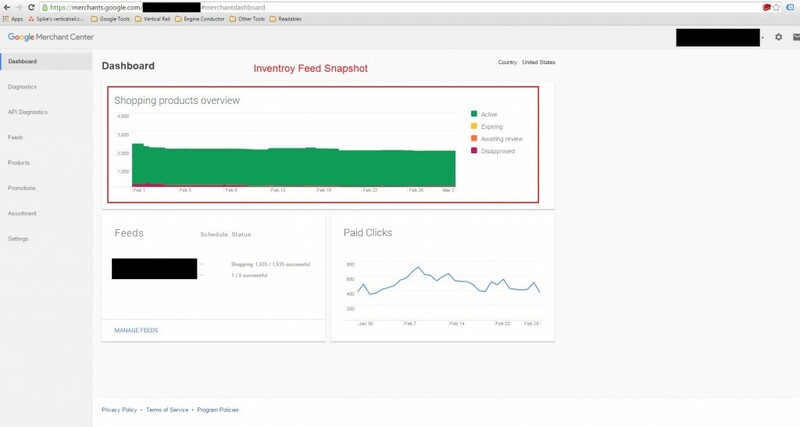 This gives you a snapshot of the health of your inventory feed over the last 30 days and shows you how much of your inventory is active and searchable in Google Shopping, products expiring soon, those awaiting review, and disapprovals all in a single color coded graph. 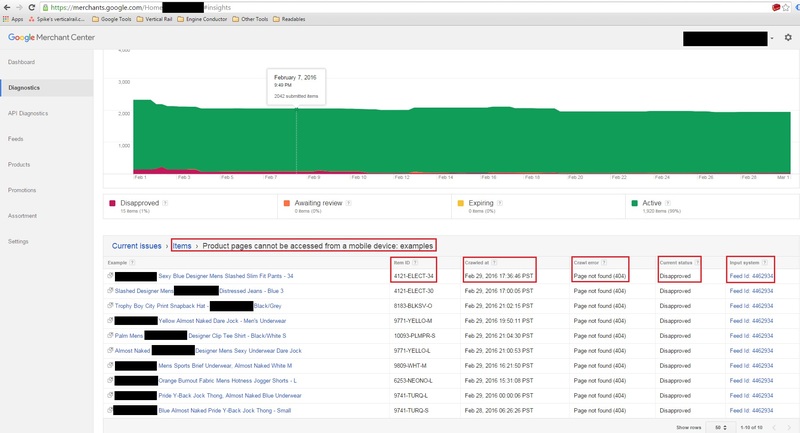 If you mouse over any portion of the graph, it will display the timestamp for that data and the exact numbers for the four statuses the dashboard tracks. While the dashboard offers a snapshot, the Diagnostics tab offers the most useful data on disapprovals in your feed. If you click on it you will see that your feeds current issues are divided into three categories which you can click into: Account, Feeds and Items. Any category with issues in it will be highlighted blue. Within each of these categories, notifications will be in blue, warnings in yellow, and errors in red. The Account issues affect the entire account. Many times, these take the form of warning which can then lead to an account suspension. To the right of the warning, there will be a little text bubble which, when clicked on, will tell you the extent of the issue and what the deadline is for resolving it. Some warnings do not lead to an account suspension and will have no due date. For those that do, that means that Google will do a thorough review of your feed on that date, and if the cited issues are still present then your account will be suspended from Merchant Center until you have resolved the issues, resubmitted the feed and informed Google. Google will perform one courtesy review of your feed before that due date if asked. This can let you to remove the warning quickly, but if the issue has not yet been resolved then the account warning will stay and they will not perform another review until the due date. Next is the Feeds Issues section. Something has to be critically wrong with your feed to see a warning here. If you do, it likely means that your feed did not successfully upload. Merchant Center will default to the last successfully uploaded feed, but this can lead to many other issues such as mismatched pricing and availability so you’ll want to resolve any feed issues quickly. Finally, there is the Items Issues diagnostics section. This is the meat and potatoes of dealing with Merchant Center disapprovals. When you click through, you’ll see a list of the current item level issues in Merchant Center broken down by the type of issue. The list starts with errors, which are product disapprovals, at the top in red, then warnings in yellow, with the notifications in blue at the bottom. 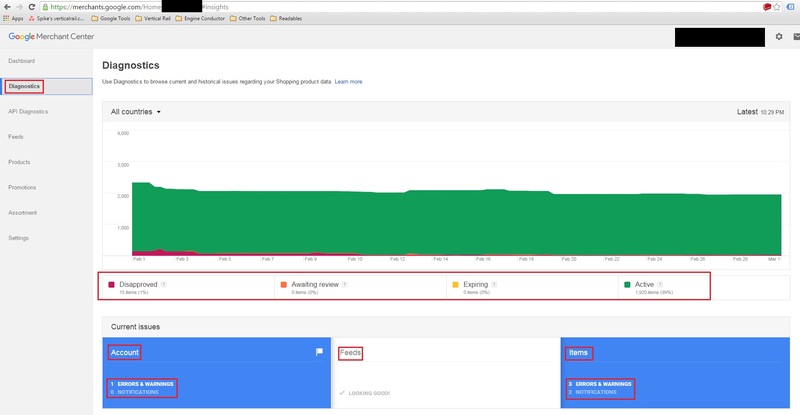 Each issue will tell you how many items in your feed are affected and has a “Learn More” link that will open the Google Support page relevant to that issue. 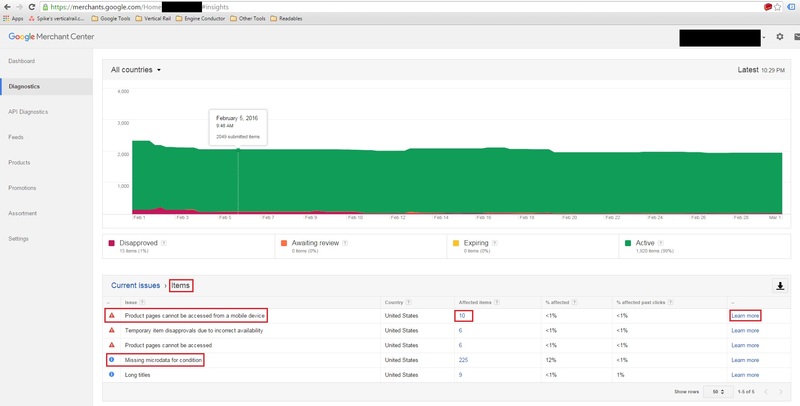 If you click on the number in the affected items column it will open a page that displays a random sampling of 50 items that are affected by that issue. It will also give you an item ID, when the item was last crawled, it’s current status, the Feed ID it belongs to, and some kind data related to the individual disapproval reason (such as a link to an image URL for an image disapproval). 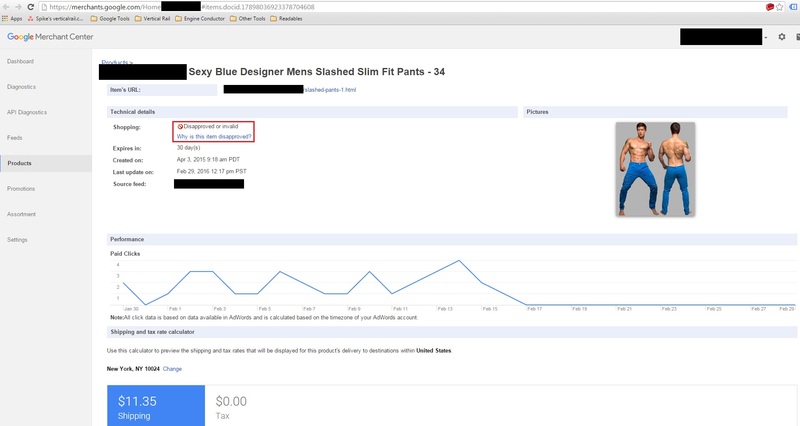 If you click on a product name, it will open up a new tab with that items Merchant Center Product Page that will show you all of the data currently associated with that item from the feed and the specific disapproval reason for the item. Unfortunately, despite what the Merchant Center interface will tell you, you cannot set it to display anything other than those 50 products for a specific disapproval reason. What you can do is download a CSV file of all the item level issues from the “Current issues > Items” screen by clicking on the download arrow on the right side of the screen just below the feed graph. Once you have this sheet, you can filter and sort by issue to get a comprehensive list of problem SKUs/IDs. 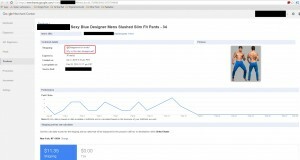 So now you know how to find issues in Google Merchant Center and how to get granular with them down to the individual product level. 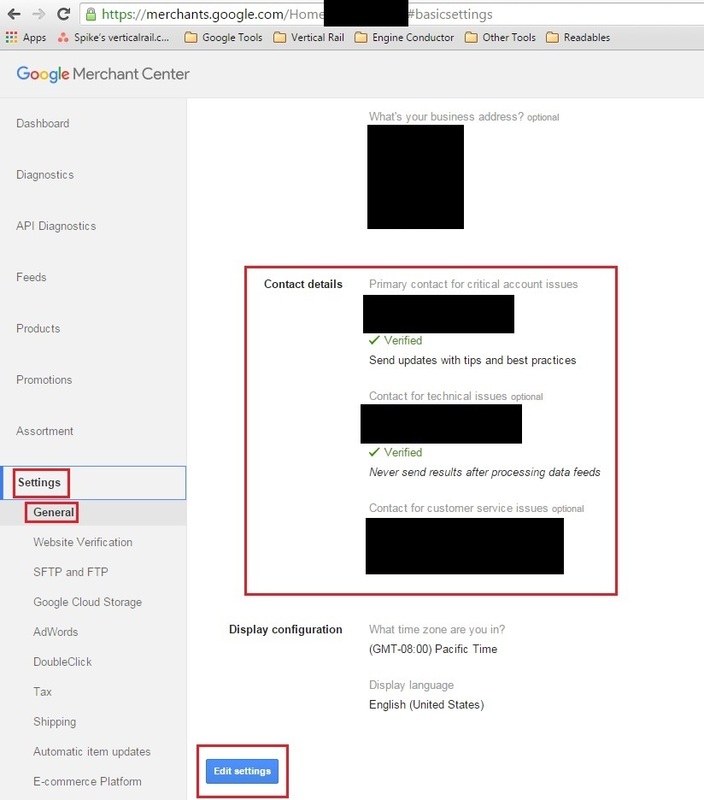 In our next articles on Google Merchant Center we’ll start looking at some common disapproval issues and what steps you can take to resolve them. After all, a healthy feed means healthy profits! 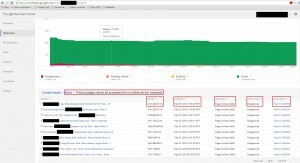 PrevWhat’s the Difference Between Adwords & Adwords Express?